The object of the present publication will be attained, if any person find assistance from it in bringing his own thoughts and feelings into more entire unison with those recommended and exemplified in the Prayer Book. The work does not furnish a complete series of compositons, for many of them are rather adapted with more or less propriety to the successive portions of the Liturgy than originally suggested by them. Something has been added at the end concerning the several Occasional Services, which constitute, from their personal and domestic nature, the most instance of that soothing tendency in the Prayer Book, which it is the chief purpose of these volumes to exhibit. Fig. 1. John Keble, The Christian Year: Thoughts in Verse for the Sundays and Holydays throughout the Year, vol. 1 (Oxford: W. Baxter, 1827). Text: Analysis. The reference to Luke 24:29 is explored in stanza eight (“Abide with me from morn till eve”). The other stated Scripture reference pertains to the last line of stanza nine, “We are in port if we have Thee,” which alludes to John 6:21 (“Then they willingly received Him into the ship, and immediately the ship was at the land whither they went”). The end of stanza eleven possibly refers to Mark 10:21 (“take up the cross and follow me”). Fig. 2. The Metrical Psalter, ed.William Irons & Henry Lahee (London: Novello, 1855). One of my reasons for disliking it is the resemblance it bears to a drinking song, “Se vuol ballare,” in Mozart’s Nozze di Figaro. As Mozart produced that opera in 1786, he is responsible for the opening strain, which suits his Baccanalian words very well. But to hear “Sun of my soul, Thou Saviour dear” sung to a lively tune, unsuitable to sacred words, often has the effect of driving me out of church. Fig. 3. Church of Ireland, Church Hymnal (Dublin, 1873). Tune 3. HESPERUS was written by Henry Baker (1835–1910), reportedly in 1854. It was entered anonymously into a tune survey facilitated by The Penny Post (London) for Keble’s “Sun of my soul,” then printed in that magazine as a preferred option in April 1862, “Tunes for Keble’s hymn,” pp. 67-68 (Fig. 4). Fig. 4. The Penny Post (London, April 1862). Fig. 5. 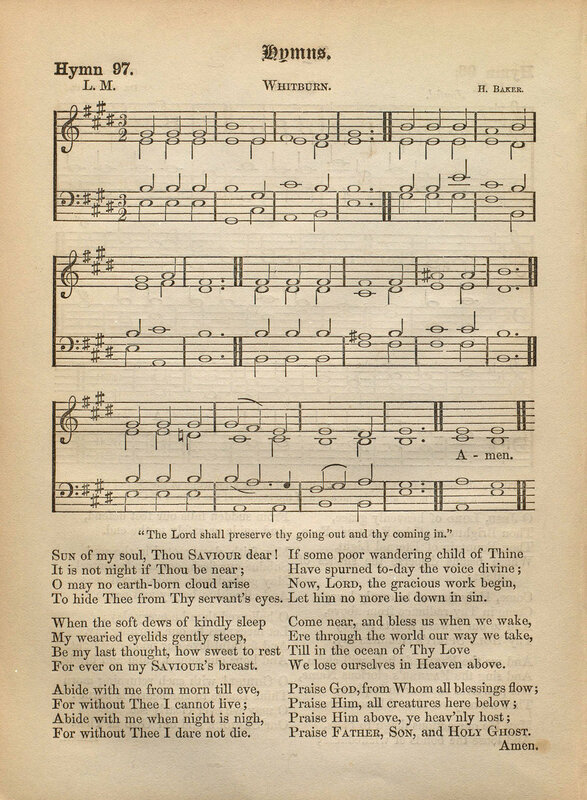 John Grey, Hymnal for Use in the English Church (London: 1866). Tune 4. MARYTON was composed for Keble’s hymn by Henry Percy Smith (1825–1898), first published in Arthur Sullivan’s Church Hymns with Tunes (London: SPCK, 1874 | Fig. 6), where it was originally called SUN OF MY SOUL. Like Tune 3 above, this melody also has a close association with Ray Palmer’s “Jesu, thou joy of loving hearts,” a translation of “Jesu dulcis memoria.” The shift in name to MARYTON is unclear, but it happened as early as 1898 in The Church Hymnary, edited by John Stainer. Fig. 6. Arthur Sullivan, Church Hymns with Tunes (London: SPCK, 1874). The Hymnal 1940 Companion, 3rd Rev. Ed. (NY: Church Hymnal Corp., 1956), p. 86. 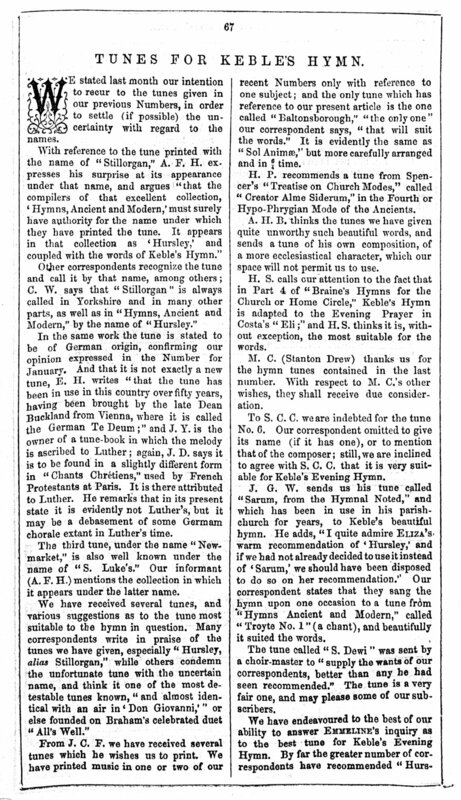 John Julian, “Tis gone, the bright and orbed blaze,” A Dictionary of Hymnology (London, 1892), p. 1178. “Sun of my soul, Thou Savior dear,” Historical Companion to Hymns Ancient & Modern, ed. Maurice Frost (London: William Clowes & Sons, 1962), p. 140 (no. 24). Carl P. Daw, Jr., “QUEBEC,” Glory to God: A Companion (Louisville: Westminster John Knox, 2016), pp. 496-497. Carl P. Daw, Jr. “MARYTON,” Glory to God: A Companion (Louisville: Westminster John Knox, 2016), p. 706.